I’ve always said that I have faith that multiplayer survival horror can work, although each and every attempt at it that I’ve played has had shortcomings. Whether it be the game’s longevity, polish, or post-release support, time and time again I’ve been disappointed. Then came Illfonic’s Friday the 13th: The Game. Surely a game with the backing of a major IP would at least be promising, right? Thankfully yes, and then some! The beta alone proves Illfonic and publisher Gun Media have captured the essence of the franchise, visually and thematically. Although it’s not without its flaws, I think my morbid prayers have been answered. The F13 beta launched with a polished interface and standardized multiplayer conventions like a party system, which allows friends to group up before searching for an online match. The option to host a private match was also available, which was what I ended up using for the majority of the beta’s duration due to a bug that broke the party system a couple of days in. Regardless of the bug, I did appreciate the strong assortment of multiplayer options available despite the game being some months away from completion. The list of graphic and control options were also appreciated, making the beta feel fully fledged and almost ready for launch. 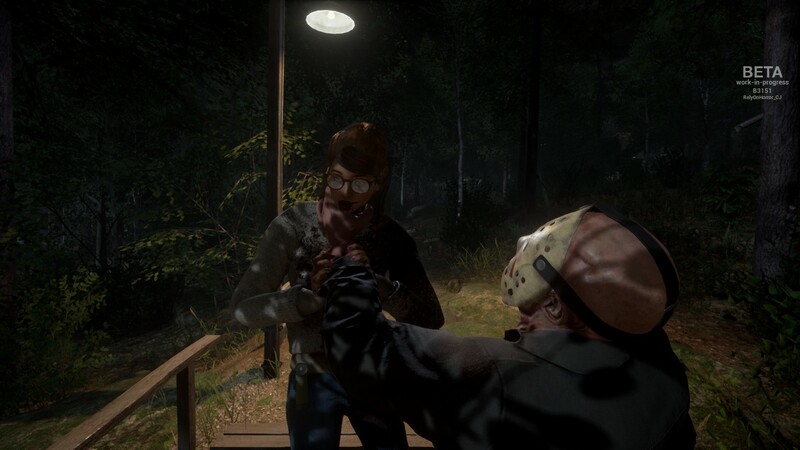 The single map in the F13 beta is Higgins Haven, the residential property and barn on one side of Camp Crystal Lake. The map is relatively large, with interiors smothered by the adjacent forest and lakeside. To escape, players complete a series of objectives, which include tasks like repairing cars or calling the police. Each escape plan requires players to move through and search the map for what they need, meanwhile trying to avoid detection by Jason. From the fog steeped dirt paths to the cabins, F13’s environments are on (knife) point. As for Jason himself, oh boy is simply seeing him walk a joy for fans. The team has put a lot of work not only into making Jason Voorhees’ surroundings match those of the movies, but the slasher himself thanks to chilling mocap by Jason Voorhees performer Kane Hodder. Seeing Jason move is a nostalgia rush in itself, and watching him kill counselors (even from the receiving end) is a delight. The gist of an F13 match is simple: up to seven counselors must orchestrate their escape from the map. One player as Jason needs to kill as many counselors as he can, using his signature level of brutality. In the match lobby, players choose from their batch of counselors and Jasons prior to readying up. A handful of counselors were available in the beta, with some locked behind level requirements — same with the Friday the 13th: Part II Jason. Playable counselors each come equipped with their own skill levels — which include stealth, stamina, strength, luck, intelligence, composure, and speed — as well as three obtainable perks tied to level-based points. Taking heavy cues from survival horror games, counselors are disempowered but not without some defensive capabilities. Around the map some light melee weapons and shotgun reside, meaning you can tumble with Jason if the situation calls for it. 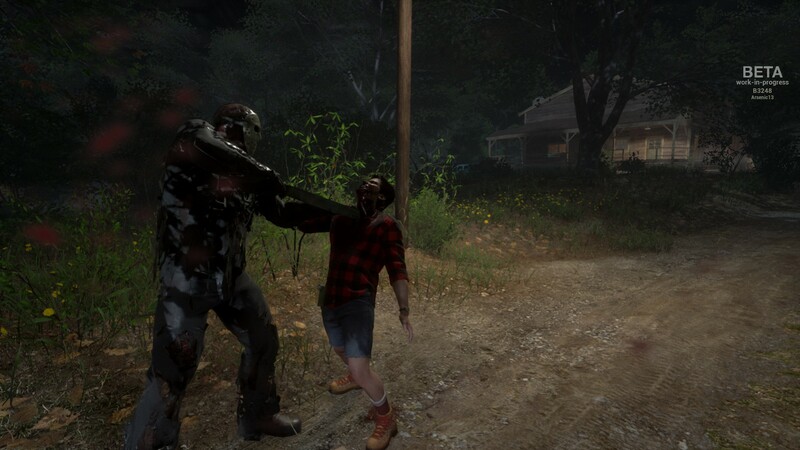 The combat mechanics for counselors are a bit too understated, though, and often went ignored by players. Those who were aware of them learned they could attack, dodge, and counter Jason’s assault, while regaining stamina in the process. I often saw counselors wildly swing their weapons at Jason in a last ditch effort to escape, unaware there’s a lock-on function that enables the aforementioned defensive capabilities. If captured by Jason’s loving embrace, players can initiate a frantic QTE to wiggle free or use a defensive item like a pocket knife to stun the lumpy giant. Each Jason, tied to a different entry in the film franchise, possesses unique traits, split between strengths and weaknesses. Whereas one Jason may have faster movement speed ideal for catching a counselor on the run, another has a tighter grip for once he has caught one. 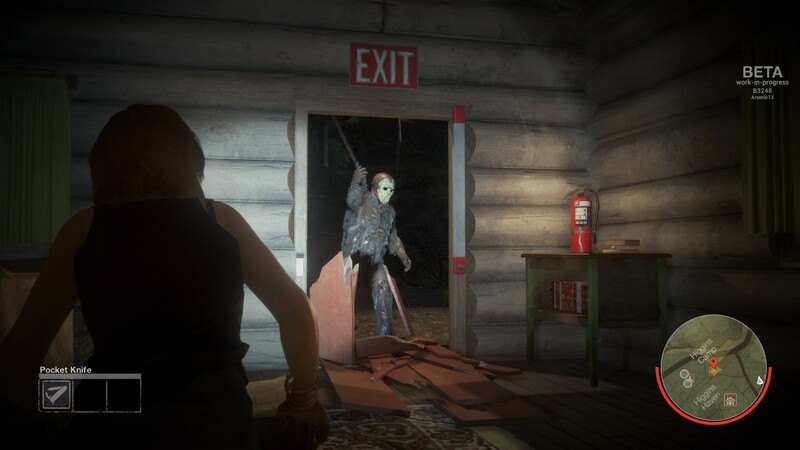 Counselor and Jason character variables mean each match in F13 shouldn’t play the same if you’ve chosen a different character to play as, but here’s where the game begins to show its issues. Some hours into playing the beta, myself and friends began leaning toward playing as counselor Vanessa simply because she had high speed/stamina, meaning she had the best-perceived survivability once found by Jason. While we were correct in our belief that she’s an ideal character to use to outrun him, we like many had overlooked the nuances of composure — a fear-based system each counselor survives by. Composure works by having environmental elements like darkness and light, as well as teamwork, affect a counselor’s demeanor, and in turn their odds of being spotted by Jason. This system is brilliant on paper, but the game’s execution doesn’t do it proper justice through a simple lack of visual feedback for the player. Reading through the How to Play notes in the game’s main menu isn’t adequate to convey how integral composure is to minute to minute gameplay. 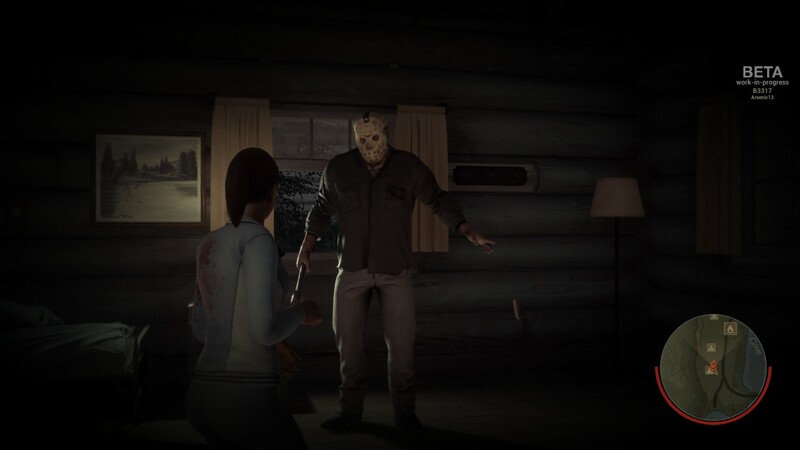 In addition to a playable or animated tutorial, F13’s most interesting mechanic is in desperate need of some type of on-screen effect or indicator of the changing tides of a counselor’s composure. It’s simply not clear enough in the game what actions raise composure back up, like regrouping or staying in lit areas. Counselors express their fear through facial animations, body language, and sound, but these indicators are either not fully fleshed out enough in the beta to sufficiently make players aware that they can actively manage their composure, or not enough visual feedback overall. 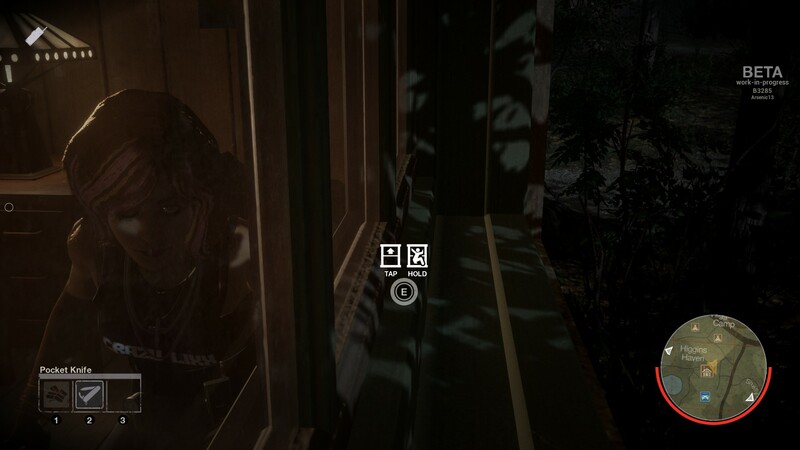 There’s a sensitive balance I’m sure the developers wanted to keep between immersion and game’s UI elements, but some sort of soft “healing” effect on screen would go a long way to teaching players what to do to make their characters less of a target for Jason, and in turn make successful use of the game’s many hiding places. Metal Gear Solid: Peace Walker‘s co-op halo effect comes to mind when thinking of a simple solution. From what I observed over a dozen hours of playing the beta, a significant portion of the F13 player base was simply ignorant to how to manage their composure, effectively making matches follow a similar and un-ideal pattern where counselors would shortly meet their demise after being seen by Jason. As a result, interior hiding places, such as a closet or under a bed, are not useful because players weren’t fully aware of their characters’ poor composure. Interiors simply aren’t large enough either to warrant Jason having the ability to detect counselors inside regardless of their actions. So this ultimately puts counselors in a major handicap against Jason. These problems didn’t ruin my experience or damper my expectations, though! Compounded with some expected stat balancing tweaks needed between counselors and Jason(s), it just jumped out as what’s needing the most attention to make the game play as designed. I don’t mean to rant about the game’s issues because I didn’t like it, but because I emphatically enjoyed so much about it. With the beta, now is the time to give feedback to help the dev team make a better game. Consider this — hopefully constructive — rant over. Let’s get back to what’s awesome about F13. What counselors lack in composure and sheer strength, Jason makes up for in droves. Embodying the iconic killer was one of the most satisfying feelings I’ve had in a multiplayer game in years. Jason’s main goal is just to do what mamma tells him and get rid of the pesky teens that hurt her. Jason’s ability set is interesting in that the dev team had to design a mechanic that answers how Jason seemingly can appear anywhere and catch up to would be victims, despite his tank-like movement speed. Jason’s skill set includes a long and short range teleportation ability, one utilizing the map for specific drops while the other is manual with a lengthier cooldown and imprecise end-point. You’ll use the short distance teleport the most when in pursuit of other players. His second most useful ability lets him detect excessive noise from afar by highlighting counselors and interiors where they may be hiding. The fourth and final ability is sheer rage: for a limited time Jason can barge through doors and select walls rather than breaking them down, and strengthen his grip on counselors when caught. The Friday the 13th franchise has been defined the creative kills found within each movie. The team behind the game know this well and have devised a kill system that includes equipable skills unlocked from leveling up, and also context-sensitive kills scattered across the map. Once you get tired of, say, forcing your thumbs into heads, or crotch chopping, or choking people to death, you can look for markers in your immediate area to do something even more brutal. 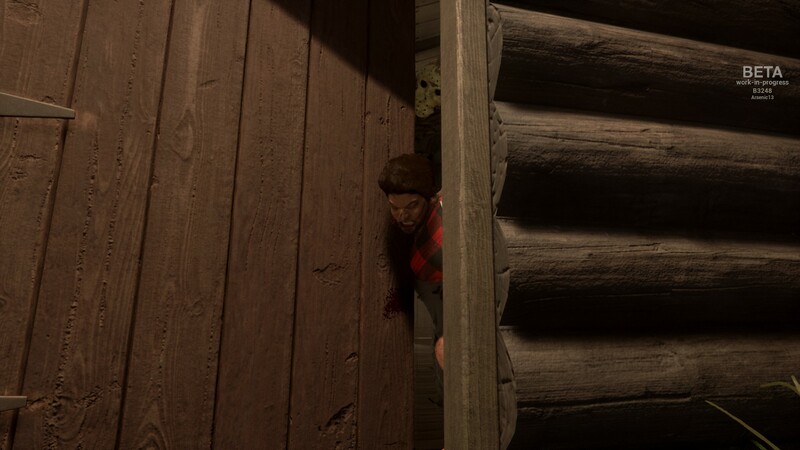 In my time playing the F13 beta, I found a few environmental kills, which included — head stopping against trees, smashing a head in a door frame, tossing out the trash through a window, hanging a body like a jacket, and cooking up some face by shoving someone in a fireplace. As I said earlier, even on the receiving end it’s glorious. 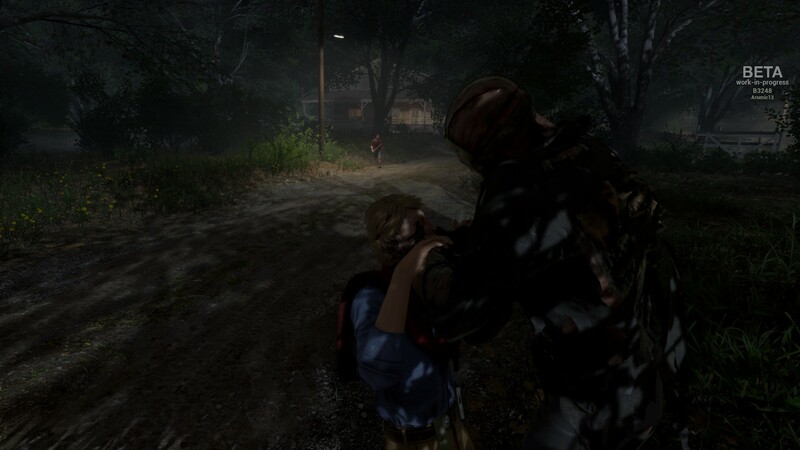 If I had to highlight my favorite moment playing as Jason, it would be appearing on the road in front of an escaping vehicle to stop it dead in its tracks. 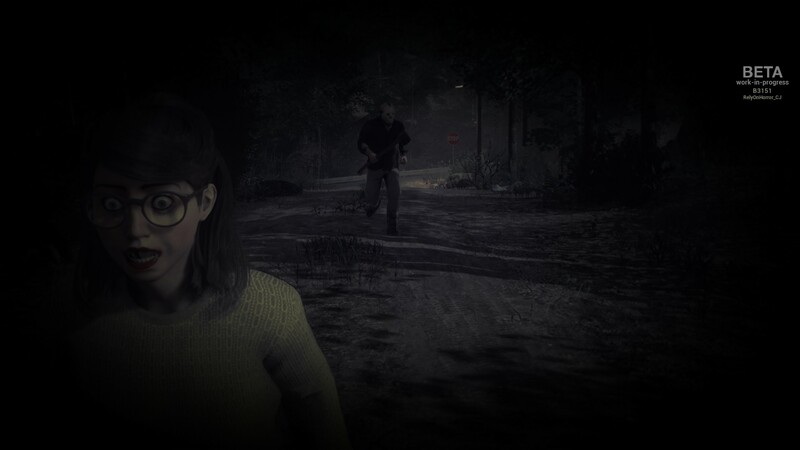 As the car halted to a stop, totaled from the sheer unstoppable force that is Jason Voorhees, I approached the driver’s seat to the horror of the stunned counselors. I then proceeded to pull the driver out of her seat and force my thumbs into her head. The others fled as her last gurgles could be heard. I laughed and smiled. It was perfect. Whether you’re performing well or poorly as Jason, his mother Pamela can be heard uttering words of encouragement to you throughout matches. Fans of the series are well aware that Jason is a mamma’s boy, and this carries to the game exceptionally. You’d think hearing a mom tell her boy to kill better would be funny, but Pamela’s performance is chilling and a treat for fans. If a counselor happens to stumble upon her mummified head, Jason can even hear her calling out to him. 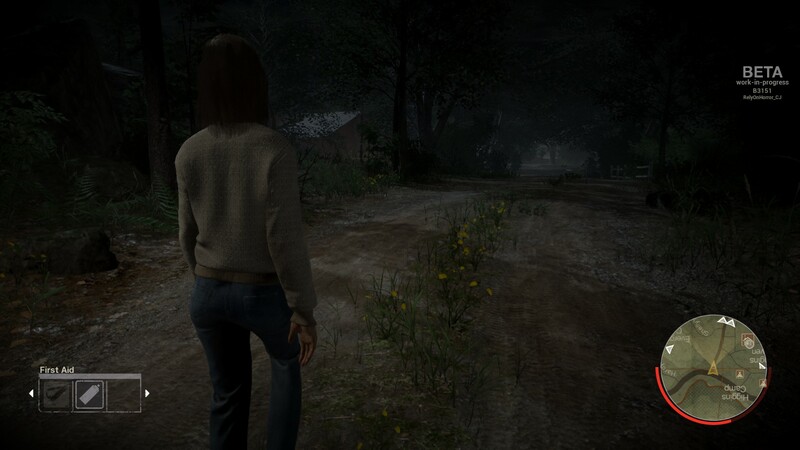 Here’s hoping we’re also treated to an Easter egg where female counselors can don her iconic sweater to hypnotize Jason as seen in the movies. The typical F13 match takes a little under 20 minutes to complete if the counselors aren’t complete dummies. And during that time, F13 can be one of the tensest games you’ll play online with friends. Something I observed in matches, regardless if using in-game voice or while in a chat room, is that most if not all players stop talking out of fear on occasion. It’s amusing and shows how well Illfonic and Gun Media have already created a dread-filled multiplayer game. When being pursued, counselors can do a variety of things to escape Jason. Windows can be jumped through — either gracefully or painfully, and doors slammed as well as locked and barricaded. The latter remains a source of the beta’s most severe bugs, though, with doors often stalling players or outright freezing Jason mid-animation. Interacting with them can be cumbersome as well when in a hurry, with unintended actions like closing from outside rather than inside, or doing either at the wrong speed. Doors are in dire need of a fix, but as with most of the technical wonkiness with the beta, I believe fixes will come naturally as we approach launch. Speaking of navigating the environment, one addition I’d like would for counselors to have is the ability to at least be able to climb over waist-high fences. It’s a bit jarring that their obstacles related moves are limited to windows. 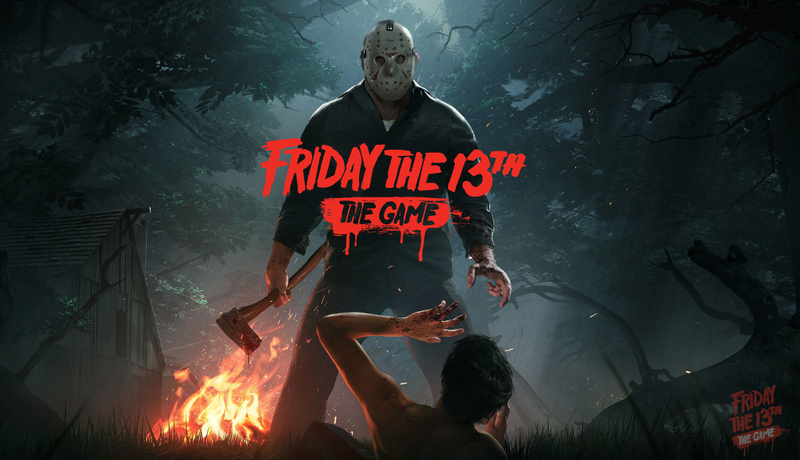 How fitting that Friday the 13th, a property that inspired the slasher genre and countless horror games, would enter the space with a game that’s not only ambitious but already so impressive while in beta. I aired my complaints about a few elements which I believe need to be fine tuned before launch, and I hope we’ll at least see a compromise that ensures the game takes the crown I’ve so long hoped it would. Friday the 13th: The Game is a blood-soaked love letter from fans of the franchise, for fans, and it’s primed to be a damn solid game too. Just turn the beta back on. Please?